The history of TETCO begins with Tom E. Turner, Sr. In fact, the name TETCO is a combination of Mr. Turner’s initials and the abbreviated form of “company.” Today, Mr. Tom Turner is widely regarded as one of the most important Americans in the history of petroleum retailing. His numerous contributions to the oil and gas landscape of South Texas and the United States are legendary. In recognition of these accomplishments, Mr. Turner was inducted into the 1 NPN Oil and Gas Industry Hall of Fame in November, 1981. A true pioneer, Mr. Turner’s TETCO is the embodiment of his inexorable vision and commitment to provide the very best in service to his customers. Tom Turner left school at age thirteen to work in a grocery store to support his family. Ever since this early entry into the job market,Tom Turner has exhibited a work ethic that others have marveled. Some years after entering the grocery business, he wed Mary Polansky. Tom and Mary had two children, Tom, Jr. and Fred. In 1937 the family of four moved from Fort Worth to San Antonio to look for expanded business opportunities. At the tail end of the Depression, times were tough and jobs were extremely scarce. Refusing to give up, Tom obtained work at a gasoline service station owned by Sigfried Moore. Tom and Sig worked together until 1943, at which time Mr. Moore retired. Seizing a golden opportunity, Tom purchased the service station and obtained a $350 loan to lease the property. Tom worked all day at the station and then drove all night delivering gas in a tanker truck he purchased. Sixteen to eighteen hour working days were normal and this dedication to work has stayed with Mr. Turner throughout his life. In the late 1940’s Mr. Turner bought another store, bringing his total to two. He recruited his brother to operate the newly acquired store and enlisted his wife, Mary, to assist him in operations. His two sons would soon join the ranks of Tom’s employees. 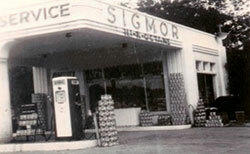 By the 1950’s the Sigmor Gas Station chain, a contraction of Sigfried Moore’s name, had grown to a total of twenty retail outlets, each operating within San Antonio. During this time of expansion, Mr. Turner began a sort of revolution in the petroleum retail industry. He began to experiment by offering his customers convenience type items. In addition, he instituted self-service lanes where customers could pump their own gas. Anticipating the emergence of superstores in the 1970’s, Tom Turner’s innovative marketing programs are widely regarded as twenty years ahead of their time. In addition to innovative marketing programs, Tom succeeded in his real estate ventures. Challenging the then accepted notion that intersection locations solely survived in the service station business, Tom began aggressively acquiring land located mid-street. This unique purchasing practice allowed him to acquire relatively inexpensive land on which to build more stations. This formula of rapid expansion worked with remarkable success. By 1983, Sigmor comprised 575 locations throughout Texas and eighteen surrounding states. Most amazing, Mr. Turner amassed this remarkable collection of retail locations while keeping Sigmor a family owned corporation. Mr. Turner’s business involvement spans not only multiple decades, but also multiple industries. Over thirty years ago, Mr. Turner and long-term colleague, Arch Kelly, started Mission Petroleum Carriers. Today Mission is still a TETCO company and consists of a headquarter’s office in Houston, TX, and twenty terminal locations throughout the United States. With Mr. Kelly still at Mission’s helm, the company continues to grow in size and profits year after year. In the 1970’s, Mr. Turner owned Industrial Lubricants Co., a huge warehouse facility that burned down in the 1970’s. It was immediately rebuilt and became a shipping and storage warehouse for petroleum-based lubricants. In 1971, Mr. Turner purchased Gensco, a national supplier of industrial-grade pipe. He would later use pipe manufactured here to construct a 70 mile pipeline between his 240,000 barrel bulk storage depot in Corpus Christi, TX, and his 50,000 bpd refinery in Three Rivers, Texas. Mr. Turner’s business involvement branches into the food service, paving, industrial sign silk-screening, drilling, construction, banking, radio, semi-professional sports (as former owner of the San Antonio Dodgers minor league team), truck bumper manufacturing and real estate industries. He even built what is still regarded as one of the most elegant country clubs in Texas, The Club at Sonterra. During the latter part of 1999, TETCO Stores, LP entered into a joint venture with Mobil Corporation. The venture included approximately 320 salary operated and dealer related outlets. In December, 1999, Exxon and Mobil merged, at which time the Federal Trade Commission mandated Mobil to divest their joint venture interest with TETCO. Consequently, in March, 2000, TETCO purchased Mobil’s joint venture interest giving TETCO 100% ownership in TETCO Stores, LP. 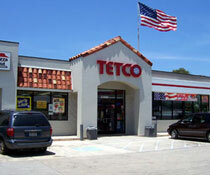 Within a short period, TETCO regained a major presence in the Texas market reminiscent of the Sigmor days. In November 2012, TETCO, Inc. entered into an agreement with 7-Eleven to acquire the retail and wholesale assets of San Antonio-based TETCO, Inc. 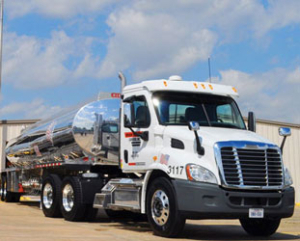 The assets included company-operated convenience stores in Utah and the Dallas-Fort Worth, Austin and San Antonio areas of Texas plus fuel distribution to TETCO’s wholesale-distributors. TETCO, Inc. currently consists of Mission Petroleum Carriers, Alamo City Truck Service and Barbarosa Foods.